It has extended in space and time considering the Ozubulu massacre that engulfed our people barely fortnight ago. Just about two hours following the gruesome incident, the Anambra State governor, Willie Obiano in cahoots with the State Police arrived the scene, and incidentally reported it as a result of the vengefulness of bitter feud between rival drug dealers. That has left every sane mind cogitating, whether or not it is an Internecine feud or a terrorist attack. Biafra Writers have been lying protracted, in scrutiny, to unravelling what transpired over the bloodbath. The speciousness of labelling that onslaught a drug war cannot be swept under the carpet. Obiano exonerated himself from queries that should have followed the atrocious crime that supervened under his watch; in addition, suborned the State Police, thus terming the mayhem a drug war that emanated from South Africa. At this juncture, Biafra Writers make bold to say that Governor Willie Obiano and the State Police resorted to playing tricks so as to mitigate the flagitious crime unleashed against his own people. • When did the efficacy of Nigeria police augmented to consummating a forensic test within two hours? • Following the disavowal publicized by Bishop who is the person claimed to be involved in the drug war, is there any corroborative evidence that lends credence to the claim that it was actually caused by feuding drug barons? 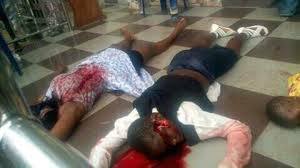 • How about the killing that ensued after the Ozubulu massacre, on August 13, 2017 in Assemblies of God Church, Oguta, Anambra State? In a house of worship too. Is that one a drug war from South Korea? An explored information from an intelligence agent has it that the attack in Ozubulu is not a drug war as was erroneously reported by the Anambra State governor, Willie Obiano. Obiano thought his re-election ambition could be in jeopardy if he let the masses know it was a terrorist attack, hence, he connived with the State Commissioner of Police, CP Garbar Baba Umar - an Hausa man, to issue an already prepared report (without investigation) in order to counter the suspicions of the awful circumstance to being a terrorist attack. The intelligence agent said that the attack was engineered by the Hausa-Fulani as a revenge over the destruction of Dangote's facilities in Onitsha, Anambra State. According to the Intel, "Sometime in July 2017, Police officers blockaded the road - just in front of Dangote's office in Onitsha - to extort money from motorists plying the road. Accidentally, a trailer lost control and ran over a pregnant woman and her children; and they died at the spot. "The Police officers took to their heels as belligerent youths ran after them. When the youths could not get hold of those Police officers, as they had taken refuge at Dangote's office; they went wild, rampaging the facilities and properties owned by Dangote. The Hausa-Fulani got infuriated by the violent disorder, then they organised a revenge that activated the Ozubulu killing. "The attackers were selected from one of the organised jihadist camps in Ebonyi State. They are also planning to continue this attack in many strategic locations in Biafra land and their targets are in phases. To mention a few, in the list are - Ogbete main market, Enugu, Aba, and Owerri." The Intel also revealed series of secret meetings of Obiano in alliance with the Obi of Onitsha [Igwe Achebe], plotting to re-arrest Mazi Nnamdi Kanu because of the 'NO REFERENDUM, NO ELECTION' campaign which is a peril to their evil manipulation against our people. And also a call to the Nigeria government to send in more Hausa-Fulani allied forces to besiege Biafra land. At this point, being the crux of the matter, we enjoin all Biafrans to be circumspect in all their conducts. Take responsibilities of all security measures at length to ensuring the safety of everyone of us. Prevailingly, we call upon the management of public institutions and firms [Schools, Churches, Market place, et cetera] in Biafraland to install security measures in order to curb the heinous crimes that have infiltrated our land. WE CANNOT RUN AWAY FROM OUR OWN LAND. BE PROACTIVE!